Cycle-sport is fascinating. You can learn a lot from studying it, even more from taking part; but – really -trying to go fast on a push-bike is perverse. If you want to go fast get a motorbike. When travel is voluntary there’s no problem with going slowly. If travel is a pleasure why would you want to get it over as quickly as possible? The real point of a push-bike is to go slowly. Cycle-sport is fascinating. You can learn a lot from studying it, even more from taking part; but – really – trying to go fast on a push-bike is perverse. If you want to go fast get a motorbike. When travel is voluntary there’s no problem with going slowly. If travel is a pleasure why would you want to get it over as quickly as possible? The real point of a push-bike is to go slowly. Going slowly means that – if you want to make the kind of trip that can be drawn on a 30th Anniversary Ortleib pannier, away from polar regions in Summer – you’re going to spend some time riding in darkness. Nowadays the Dunwich Dynamo has plenty of alliterative homage. In twenty years riding all night has migrated from almost secret vice for lonely old men to become an established niche in the many-roomed mansion of bicycle-madness. At this time of year some people email to ask: “How to register?” “Are there places left?” even “How much does it costs?” It’s more of a pleasure than a chore to explain to them that it’s just a ride to the coast. Turn up. Set off. Have fun. When people ask “if I organise it?” I counter with an illustrative question who organises Christmas? Your cycle event passes through the village of Peasenhall where I have a business called Emmett’s. We have been in operation since 1820 making traditional hams and bacon and held a Royal Warrant for over 35 years. We have now opened up a cafe serving teas, coffees and light meals.This has proved to be very popular.The reason for my email is to highlight this service in respect of the Dunwich Dynamo and to see whether we could have a link to your site. …to enthusiastic front-garden gazebo and camping-gaz amateurs. The growth of pop-ups seems to be reaching a breakthrough but it’s not all positive. Since I suggested the food stop at ********* I have been getting some very worrying feedback from local residents who are deeply unhappy at the behaviour of some of the riders who cause considerable and prolonged disturbance as they pass through the village, causing many folk a sleepless night. The intention was that our local Guides group run the food stop, as my daughter is in Guides and this was to raise funds for her work in ********, but I am very concerned that as we will present a fixed target for local resentment the risk of an unpleasant reaction on the night is too great for us to take. In view of this I have taken the decision to abandon the idea. This is obviously a great shame but even if there is no reaction on the night the blame for any disturbance will be laid at the door of Guides and my family, and this is something I cannot afford to risk. This gracious withdrawl is a symptom of a persistent problem. We all know riding a bike doesn’t make you a nice or sensible person. Some people are so dumb that – because they set off from Brixton, Shoreditch or Homerton and have only been riding a bike – they think they’re still in the inner-city deep in sleepy Suffolk. Others, following the modern delusion that riding a bike gently for 185 kilometres is some kind of ordeal, worthy of being sponsored to collect money for homeless pandas, don’t have the capacity to consider the feelings of others. Like hikers on the summit ridge of Everest shuffling grimly past the dead and dying they can’t think beyond their own survival. Most of the persistent disturbance comes from distressed pilgrims debating navigation at junctions. Someone stops because they don’t know the way and aren’t following the route-sheet. Another clueless nitwit rocks up and they start a conversation. A third person arrives. The first decides it’s time to adjust their wardrobe or eat a sandwich, more come through, before you know it there’s an impromptu cocktail party going on. Now don’t get me wrong. The Dunwich Dynamo is a social event, but there are plenty of rural lay-bys, isolated verges and moon-lit glades to stop for a snooze, a cigarette or even some frantic networking far removed from bedroom windows. The idea is to show control, for a thousand seasoned tourists to pass like ghosts leaving ne’er a banana skin to betray their stealthy passage. Instructions on how to make a handy routing information holder for less than one pound will follow shortly. If you’re planning to make the trip this year – why not? – please set a good example, make it look easy and – softly – encourage others to do the same. Drifting home on Upper Street, N1, out on the white line avoiding conflict with anyone creeping out of White Lion Street or sweeping into Liverpool Road. Sitting comfortably just inside the plume of turbulent air towed by a number 73 bus, spying on the driver through the wing mirror and waiting for her to cut left into the lay-by along the elevated pavement and launch me toward Islington Green. My attention is caught by an advert on the back of the giant rolling windbreaker. It seems Schwalbe have launched a limited edition London-branded range of their excellent tyres. A small social advance since the days when contented cyclists could wait behind buses reading ‘Don’t just sit their fuming’, courtesy of Friends of the Earth. Nor are Schwalbe the only German company who’ve noticed that some people in London, England even the British Isles, ride bikes. My old mate – OK I once had a chat with him at a trade show – Hartmut Ortleib has a new set of 30th anniversary bomb-proof bags. You can now get a nice white, roll-top, fabric bucket printed with a handy map of our Irish Archipelago. Other charts are available for those with more ambition and time to go further, but there is – for example – no Italian edition. Some people might say these examples of Germans thinking of English people on bikes only reveal the advance of mass customisation, techniques that combine economies of scale with short runs of niche products. I prefer to think of them as us unvanishing. No proper post this week. Too much going on. Being a ‘Typhoid-Mary’ of bicycle madness is a lot harder work in May and June than the dark days of Winter. …coming soon a new event that starts in London and goes somewhere very mysterious indeed. Anyone who rides a bike regularly has a journey that amounts to nothing; maybe a jaunt just long enough to make getting a bike out worthwhile, instead of walking or – for those of a more leathery disposition – the distance that can be ridden on an empty stomach without thinking of how to refuel. A long trip is just a lot of short ones run together. With careful preparation, good morale and deft use of the formula X x 0 = 0, any voyage can be reduced to the status of ‘nothing’. The hardest thing about travelling on a push bike is the idea. If you think 187 kilometres is a long way stop worrying about the idea and use the time and energy saved to deal with technical problems as they present themselves. Never persuade anyone to ride the Dunwich Dynamo. If they do there’s certain to be a point on the trip when they wish they were at home in bed. When that moment comes you don’t want to be held responsible for their regrets. If you think somebody is under-prepared try and put them off. Alternatives are available and there’s always next year; but – if they must go – support them. The chances are they’ll succeed and love it. It gets shorter every year. If the weather is wet there’ll also be tail-wind. Epping Forest means you exit Outer London quicker than on any other radius. Moonlight doesn’t burn human skin or give you cancer. You don’t have to get up early to join in. There’ll be no tea-shops, folk museums or other visitor attractions open to tempt you off the road. The darkness is dramatic but dawn comes early and from then until breakfast time the only other traffic on the empty roads is dopey pedal bikers. However ill-prepared you are you’ll meet other pilgrims who are in a worse state than you. It crosses soft country, no deserts. Salt water is antiseptic, cold water analgesic, the big, briny bath at the end is both. Ride the Dunwich Dynamo and for the rest of your life – while you live in London, and keep a bike – you can glance at the clock as evening falls and ask yourself the question; ‘shall I ride to the Suffolk coast tonight?’ You never have to go, but your World will always be bigger. You’ll know when the time is right. Back in the day there were nice ‘T’ shirts from Mosquito. This year, to celebrate TWENTY years of pointless lunacy it’s time to launch the Official Dunwich Dynamo product range. Scientists are working on a luminous skin-cream that offers spooky zombie conspicuity in the dark then becomes a high factor sun-block after dawn, but what kind of fragrance and can it be rain-proofed? In the meantime COMING SOON the Dunwich Dynamo Souvenir handbag. You know it makes no sense. The following first appeared in ‘London Cyclist Magazine’ – without the hyper-text – in May 1998 as promotion for Dunwich Dynamo VI, when the DD was still a pay-to-enter event with routing signs and a location breakfast on arrival at Dunwich Heath. The DD is now a free, traditional event, like Christmas, only with less eating and more travel. Then there were a couple of hundred, now nobody has to count how many happy pilgrims pass. Some details of route and stops have changed and the road to Dunwich Heath is still hanging on against the hungry sea. Mostly it’s the same. The following first appeared in ‘London Cyclist Magazine’ – without the hyper-text – in May 1998 as promotion for Dunwich Dynamo VI, when the DD was still a pay-to-enter event with routing signs and a location breakfast on arrival at Dunwich Heath. The DD is now a free, traditional event, like Christmas, only with less eating and more travel. Then there were a couple of hundred, now nobody has to count how many happy pilgrims pass. Some details of route and stops have changed and the road to Dunwich Heath is still hanging on against the hungry sea. Mostly it’s the same. “I began riding out to the Suffolk coast on moonlit summer Saturday nights in the far-off country of the 1980’s. Jez Hastings , editor and publisher of the tricycle fanzine ‘One too many’, suggested that this tradition could become a public event. On Sunday mornings races and rides, for larks are plentiful; how about one on Saturday night for the owls? Jez ran a small wholesale business and his links with the bike-trade brought sponsorship from Mosquito whose location on the Essex Road has a pleasing psycho-geographical resonance. In 1992, the Dunwich Dynamo had it’s first edition. At Eastway, the London Boroughs of Hackney, Waltham Forest, Newham and Tower Hamlets abut. The river Lee has been the divide between the old London County Council and Essex and before that Middlesex and Essex, and even earlier a peace line between the Danes and the Saxons. From Eastway you ride up Leyton High Road, the hill to Chingford and into the hanging glade of Epping Forest. After a wind through Moreton to dodge the A414, you join the Dunmow road at Fyfield. Unfortunately, many excited riders miss the first control at Leaden Roding where Mr. and Mrs. Knight and their extended family offer bread-pudding and coffee. North of here on the roman line of the Dunmow Road the land is flat and the heavens wide. Early starters are not too late for chips in Dunmow. Great Bardfield and Finchingfield are so cute they even look like picture postcards in the dark. The Hedinghams, last towns in Essex, feel out of commuter influence. At Bulmer Tye the road from Castle Hedingham sweeps into the highway for Sudbury. After the winding, rolling lanes of North Essex, this runs broad and level. If that’s not enough to spur you on, gravity soon will as the road begins – gradually at first – to descend. Almost hidden in the rampant hedge is a big white sign that – for administrative convenience of putting all of Sudbury in one county – marks the borderline. The real crossing comes at the bottom of the hill where – after a shallow right-hand bend – the road bridges the river Stour and leaves the timber villages of Essex for the pink plaster of Suffolk. You feel the pattern of the country better without the distractions of the day. Beyond the control at Great Waldingfield are the Suffolk prairies where once over-lit American cold-war bases are falling derelict; not all change is for the worse. Needham Market and the crossing of the River Gipping takes the route into its penultimate phase, silly Suffolk; silly is the old word for holy. Ruined monasteries poke out of the woods and if the sun’s not up yet, it soon will be. Sometimes temperature inversions leave mist in the river valleys, while the fields between are sunlit. Foxes, rabbits and crows stare arrogantly at the bag-eyed townies. From Coddenham to Pettaugh the way is once again pencil-straight. Does the hamlet of Stone Street commemorate a time when this was paved and all the rest was the kind of mire the 1990’s would call off-road? If you ever ride this route alone, pick a line through Framsden and Framlingham and Bruisyard. For the tired sheroes of the Dunwich Dynamo, lulled by signs on every turn, this might call for too much thinking. They are sent along the A1120 whose sharp hills can make it a via dolorosa if the hot sun catches you still labouring. A last phase running down behind Yoxford sees the soil turning sandy and the farmland drifting into heath. Too many bike rides end with an anti-climax, so the Dynamo promises a monster breakfast and, should you require it, a nice piece of cardboard on which to snooze away the morning. For unconducted travellers the café on the beach opens at ten o’clock in Summer. Dunwich was once the capital of East Anglia and 800 years ago was as big as London. A storm blocked the river which killed off the port. Over centuries what remained of the town was washed away by the relentless tides. The Dunwich Dynamo is the only bike ride that gets shorter every year. In years when the event runs at a loss and I am tempted to jack in the task of promoting it, I look forward to the season when the finish route will have to be changed because the road on which it now runs has been washed away; five more years is the latest estimate. The inexorable transformation of the coastline reminds us that the permanence of change predates the modern cult of ‘progress’ and will out-last it even if we do succeed in recreating a sustainable way of living. Jez Hastings went to Islay, watches birds, paddles canoes, contributes to the Washing Machine Post and is now Scottish. Mosquito Bikes are still in the Essex Road, all their stock is nice. I’m still dreaming of becoming a cyclist. The DD now has a useful alternative – the Dalston Dynamo – which may develop into a Dynamo de l’avenir? The man Hugo Chavez likened to “a polar bear that’s had an electric shock” won the election for London Mayor – by a half a wheel or less – which has led to a new coinage(thanks to Max) – what an emborrissment. Last weeks rambling on the different preferences of Boris Johnson and Nicole Cooke, leading to the assertion that the choice between riding on the highway, and using any parallel infrastructure for cycle-traffic, is best left with the individual, attracted name-checks and green-ink denouncements on a site called ‘as easy as riding a bike’. The man Hugo Chavez likened to “a polar bear that’s had an electric shock” won the election for London Mayor – by a half a wheel or less – which has led to a new coinage(thanks to Max) – what an emborrissment. Last weeks rambling on the different preferences of Boris Johnson and Nicole Cooke, leading to the assertion that the choice between riding on the highway, and using any parallel infrastructure for cycle-traffic, is best left with the individual, attracted name-checks and green-ink denouncements on a site called ‘as easy as riding a bike’. If you fancy seven and a half thousand words (my guess is that ‘aseasyasridingabike’ is a man?) on what ‘Love London Go Dutch’ REALLY means its here, here, here and here. The thrust of the argument is that progress toward bicycle paradise demands ‘roads for bikes’ and that anyone using a pedal-cycle must be compelled to use them, and barred from any parallel street, which shall be reserved for motor-traffic because anyone who wants to ride on the road is a ‘fast’ cyclist, so leaving the choice with the individual will mean that the new network for cycle-traffic will be designed only for ‘slow’ cyclists. Perhaps I’m being over-optimistic but I feel strangely confident that an authoritarian political programme relying on the assumption that I am a ‘fast’ cyclist is doomed to failure. The other person in the cross-hairs of this ideological purge is professional bollard-farmer Richard Lewis who comes from Hackney, rides a funny bike and has drafted some sample designs for the ‘Go Dutch’ project based on the evident premise that Londoners on bikes behave in diverse, individualistic ways. I’m not that fussed about infrastructure and am confident Richard can deal with the technical criticism. Richard describes his approach thus:- “I (personally) am not after a “Dutch” design! I am after “good” design, which recognises and responds to the opportunities and constraints of the particular locations.” Whatever the fundamentalists say about ‘Dutch principles’ this practical approach ought to convince anyone who likes cycling, who wants to spread bicycle madness, that the ‘Go Dutch’ front is worthy of support. …not only will I plead guilty to holding the heresy that there are two categories of cyclist I will go further. I not only hold that notion, I actually believe there are unnumbered categories of cyclist including plenty we are not yet able to imagine. Hell I’m five or six categories on my own. How many categories of cyclist are there? Ennio Morricone thinks there are just three but Diana Ross believes there are twelve kinds of cyclist and she loves them all. I admire Nicole Cooke and am embarrassed to say that – on this issue – I have more in common with the fat, middle-aged, scruffy Englishman than the World’s greatest living Welsh person. In my defence I must add that, though I’m entertained, to ride around the Elephant – even in prevailing sub-optimal conditions – I’m not dumb enough to generalise from my own experience to everyone else’s. For adults personal risk-assessment is best left to the individual. I’m not that worried about infrastructure. I like travel and if you want to get to anywhere interesting you need to be ready to ride in a range of conditions. Watch our for rabid dogs and sunburn, but the danger almost always comes from people, so it’s best to concentrate on the human element. Having said that when it comes to bollardism I do have a favourite street in Greater London…. Funny how they still managed to cater for motor-traffic even though some sofa-jockeys just wanted to potter to the corner-shop to get fags and a pint of milk, and others blasted from Plymouth to Inverness without even stopping for a Yorkie bar. Nestled in the Lower Lea, where Inner and Outer London grind like tectonic plates, Argall Way is theoretically perfect because it has cycle-tracks on either side offering respite from any status problems people on bikes might feel about taking space on the carriageway while at the junctions there are – now somewhat faded – advance stop boxes, which signal clearly that cycle traffic is also welcome on the highway. I took these pictures on Easter Sunday 2012 when a tragic wreck on the highway meant police had closed the Lea Bridge Road to all but walking traffic for the whole day. A boy on a motor-cycle had been hit by a man in a car and then smashed by another. The metal plague has taken so many. Even then Argall Way was uncongested. Low-density development in its environs mean you never find a traffic jam there. There’s nothing much to visit. Argall Way is built on ex-railway lands and it isn’t hard to imagine a more civilised use of the area. The space demanded by clumsy vehicles with high maximum speeds ends up increasing the distances people have to travel. Like weapons of death and drugs of addiction, motorised travel creates more demand than it satisfies. Where motor-traffic is allowed to dominate to the point where – as well as a path for walking – a cycle-track is also necessary, this adds to the land-take. A cycle-track built in reaction to motor-traffic may be helpful as part of an exit strategy from motor-dependence but it’s also more land wasted enabling hyper-mobility. Cutting up space and dedicating each fraction to a particular mode spreads the inefficiency of the land-hungry to those that are otherwise able to share and adapt more easily. Given access to the whole road, when tidal flow is heavy – for example bicyclists coming out of Hackney towards the City of London around 08:30 on a Wednesday – people on bikes can take a whole traffic lane. If they’re confined to a dedicated track they have to queue in a tighter space. There are many things in the Netherlands to admire and emulate; but we can improve on their practice in one significant measure. In the Netherlands and Germany it’s illegal to ride on the road where there’s a parallel cycle-track and this is – in my experience – rigorously enforced even where following the side-path may be a less attractive option than riding on the road. There’s no practical problem with a full-hearted endorsement of the important principle that the choice between riding on the highway, and using any parallel cycle-infrastructure, is best left with the individual? An unequivocal endorsement of this principle – as a caveat to advocacy for ‘three network’ street design – defuses simple-minded, knee-jerk, ideological criticism and enables the widest possible support for a ‘Go Dutch’ agenda. Sectarianism is a gift to our enemies. The principle also provides a passive quality-control mechanism. If facilities are good enough everyone will use them anyway. In the medium-term the answer is not struggling to fit a third network into the Elephant and Castle so Nicole can pass without fear, or insisting on toughness and vigilance from bike riders so they can circulate with Boris and the motor-traffic. The priority is explaining gently and firmly – at every opportunity – to John Griffin and his fossilised followers that people on bicycles own the road and the motor-dependent must be grateful that we’re willing to graciously share it with them. Note for John:- Don’t pretend you’re in hurry. Everyone knows that if you were really in a hurry you’d be on a push bike. If you’re looking for a gentle leg stretch this weekend why not check this scenic 150 km. Meet outside the Ice Rink, Lea Bridge Road, 08:30 Sunday 06/05/12. The sedate touring group will allow conversation but more testing options are also available. Rolling hills and flying Essex cloudscapes. If you’re looking for a gentle leg stretch this weekend why not check this scenic 150 km. 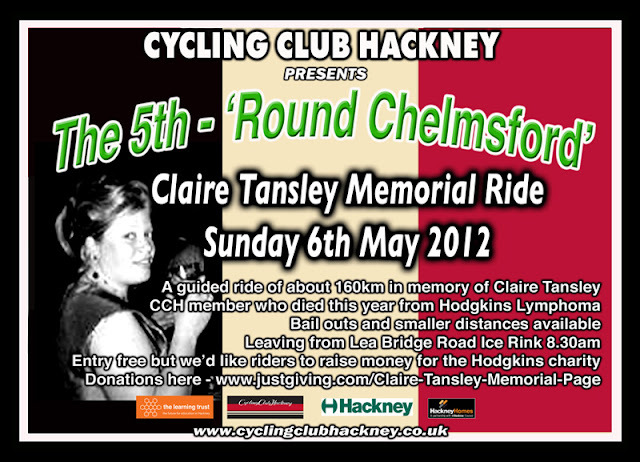 Meet outside the Ice Rink, Lea Bridge Road, 08:30 Sunday 06/05/12. The sedate touring group will allow conversation but more testing options are also available. Rolling hills and flying Essex cloudscapes. In celebration of Claire Tansley force of nature. Saturday’s big ride event has been widely reported as ‘a protest’ but it’s naive to imagine that much notice will be taken off a bunch of happy bike riders, being obedient, on a Saturday? The event was a success, but not because it made governments tremble. Rulers are always more likely to focus on the apathetic millions who didn’t turn out. Saturday’s big ride event has been widely reported as ‘a protest’ but it’s naive to imagine that much notice will be taken off a bunch of happy bike riders, being obedient, on a Saturday? The event was a success, but not because it made governments tremble. Rulers are always more likely to focus on the apathetic millions who didn’t turn out. It was a success mostly because those who took part felt validated, part of something big, powerful, progressive and exciting. “WE WANT SAFER CYCLING STREETS” is an odd slogan. The event itself was taking place on the streets of London and – despite the odd touch of wheels and some temporary ear damage – was devoid of mortal danger. No serious injuries were reported. “WE WANT SAFER STREETS” would be evasive enough. “WE WANT SAFER CYCLING STREETS” is just confusing. Aren’t all streets for cycling? Danger doesn’t come from streets it comes from people. The layout of the streets has an important influence on how people behave but worrying only about the streets, ignoring the actual source of the trouble – people – is displacement activity; focusing on something relatively simple, because the actual problem is too complicated, too daunting. When J.S.Dean – chairman of the Pedestrian’s Association – identified ‘road safety’ as a brutal ideology, formulated by the German National Socialists, and enthusiastically adopted by the British Motor-Lobby, he didn’t feel any need to explain why special tracks for cyclists were evil. Laying a cycle-track beside a street is an unambiguous statement that the people using the roadway are expected to be brutalised and brutal, to put their need to hurry – or more precisely, in an urban context, to put their desire to feel as though they are in a hurry – above the well-being of others. Under the crushing cultural and economic inertia of motorisation J.S.Dean became a voice in the wilderness. Questioning the costs of hyper-mobility is only just emerging into the mainstream after half a century during which drawing attention to its toll put one beyond the frontiers of sanity. In Central and Inner London a critique of motor-dependence now makes obvious sense. As this local consensus grows stronger we need not be as dogmatic as the heroic hold-outs of history. It’s as foolish to reject cycle-tracks because the Nazis liked them as it would be to denounce training for cyclists because self-advertising dinosaur John Griffin thinks it a good idea. Currently there are plenty of roads, where there are space for cycle-tracks and cycle-tracks would be very useful. You don’t need to ride far out from Central London on any radius to find highways where current conditions demand a very tough-minded attitude, where people on bikes are rare enough that younger motorists, or those who grew up overseas, imagine that cycle-travel on them is actually prohibited. There’s now a fashion for commentary – accompanied by pictures of everyday cycling in the cities of Northern Continental Europe – that looks eagerly forwards to the day when London ‘will look like this’. Meanwhile in the London Borough of Hackney bicycling is – in certain demographics – becoming the default non-walking mode, and an appetite for practical cycle travel is bleeding into all the other fragments that populate this nascent velo-paradise. There are historical and geographical reasons for this but it’s happening without recourse to Hitlerite infrastructure. Stevenage is the birthplace of Jack Wilshere who is not to be mistaken for Lewis Hamilton who also hails from that jewel of North-east Hertfordshire. Stevenage has cycle-tracks everywhere and far fewer riders than the London Borough of Hackney or Ferrara in Italy, where thirty per-cent of journeys are made by bike. I’ve been told Ferrara has no cycle-tracks. …and his endorsement of Dutch infrastructure at 3.14. He wants cycle-tracks, doubtless in principle and forever. But is he an aspirational role-model? 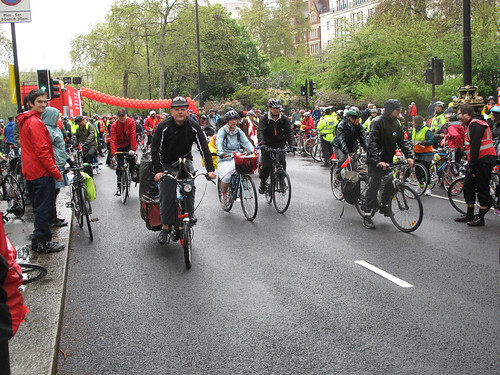 On Saturday 10,000 – give or take – rode from Park Lane up Piccadilly down to Trafalgar Square, along Whitehall and out along the Embankment. I used the event to debut my new 24 volt sound system which performed faultlessly, with a four hour run time and at least one complaint that it was just too fffortissimo. Having started on cycle-mounted remote sound in the era of cassette-tapes and progressed through CD’s and mini-discs it’s great to enjoy the solid-state stability of a digital player the size of a matchbox. The new outfit fits on a Burrows 8Freight and two wheels are a lot less stress than my last system which ran on a big old Brox. I like music on bike rides. It mocks the cult of banging music in cars, gives the most mundane spin a cinematic quality and signals to anyone watching that this is not angry it’s FUN. If you’re planning a rolling event, skates, boards, space-hoppers even pedal bikes, that might benefit from a sound-system that leaves nothing but silence between the notes, or are thinking of a party somewhere conveniently off-grid and don’t want a generator hum, drop me a line and we can talk.